US Heavy Metal act DEAD BY WEDNESDAY will release worldwide their fifth album “The Darkest Of Angels” through EMP Label Group founded by Megadeth bassist David Ellefson on May 20th. The album features 11 killer tracks with 11 heavyweight guest vocalists including: Brian Fair (Shadows Fall), Eric AK (Flotsam and Jetsam), John Arch (Fates Warning), Rob Dukes (Generation Kill, ex-Exodus), Carley Coma (Candiria), Waylon Reavis (ex-Mushroomhead), Sean Danielsen (Smile Empty Soul), Paul Stoddard (Diecast), Kris Keyes (formerly Gargantua Soul), Antony Hamalainen (Armageddon) and Ceschi Ramos (Fake Four Inc.), and produced by Toxic Holocaust drummer Nicholas T. Rage (Hatebreed, Kingdom of Sorrow, Jasta). Throughout the years they have toured relentlessly, and in doing so have found their own sound and style, creating a fierce loyal fan base along the way. 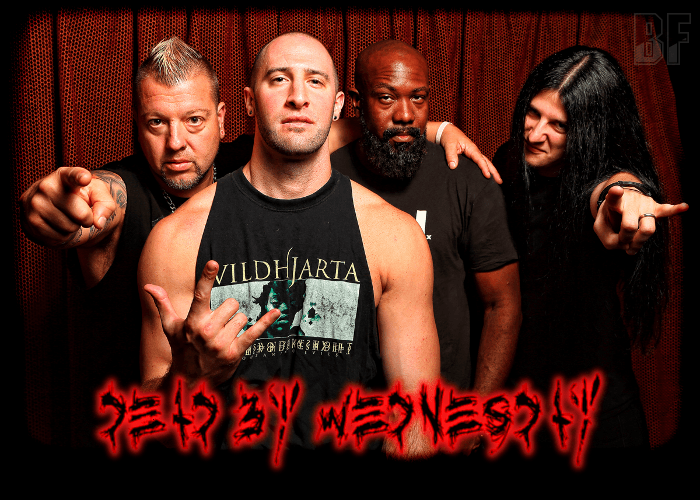 Dead by Wednesday has recently rocked the stage at the Rockstar Energy Drink Mayhem Festival, along with White Chapel, King Diamond and Slayer. They also played at Rock & Shock Horror Festival several years in a row, with Life Of Agony, GWAR, Hatebreed and Soulfly. At the New England Metal Festival they played along with Battlecross, Goatwhore, Dillinger Escape Plan and Opeth. This March they shared the stage with death metal titans Revocation at The Providence Tattoo & Music Festival.